Learn To Play 'Mary Had A Little Lamb' On The Piano! I'm going to teach you this song for two reasons. First, so you'll learn a song, but more importantly to teach you how to train your ear . Let's start the song on the E above middle C. If we sing the song and pay attention to what the notes are doing, we'll know that the first change is to step down. By playing along on our piano as we sing we can deduce that the song goes E D C D E E E.
Let's try to do the next part by ear. It goes down a little bit again, then at the end of the next verse does a little jump. It goes D D D E E G. The whole song is based on that five note stretch from C to G and only uses four of those notes. See if you can figure out the rest of the song for yourself, using the methods I've demonstrated. If you listen you'll hear that the song tends to pull your ear to the C. The song also uses a lot of notes of the C major scale, so we can make a good guess that the song is in the key of C major. So let's create some chords to go with the melody. First, since we are in the key of C, let's start with a C chord in the left hand. When the second verse starts, the C doesn't sound quite right. Let's try the fifth chord of the scale, G. Play it in the first inversion to make the transition smoother. When the melody goes back up to the E note, let's switch back to the root chord. We do this because the root chord contains an E.
So, with two chords, and four notes, we have played a simple song. But we can play that song in any key. Let's start on the A this time. We know that in the key of C, the song starts on the third note of the scale. A is the third note of the F major scale, so to start on the A, we need to play in the F major scale. We also know that the second chord is the five chord. This is where knowing your intervals comes in. 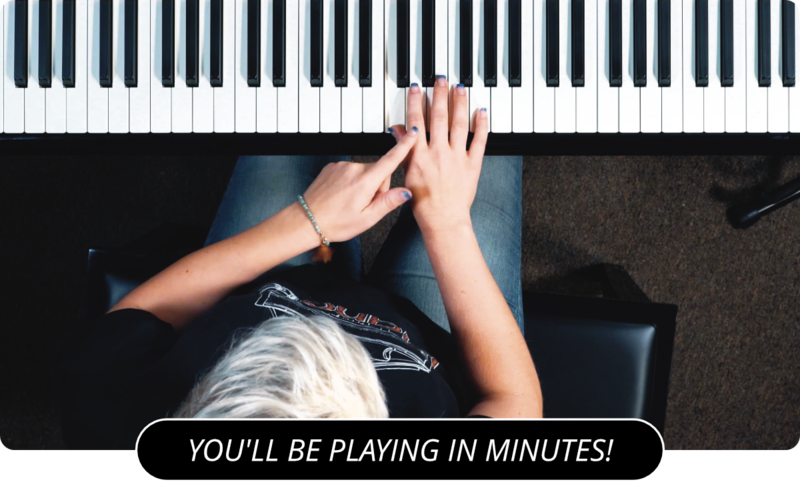 Using intervals, you can play a song in any key because you aren't dependent on someone else telling what the notes should be. For some more easy piano songs, I recommend checking out Happy Birthday and London Bridges Falling Down .